​​​​​ DALLAS-FORT WORTH - In third quarter 2016, apartment occupancy reached an all-time high of 96.0 percent, reflecting underlying market strength and strong lease-up velocity of new units. In turn, rent growth levels remain well above the historical norms and strong demand pushed up occupancy in 3Q 2016. 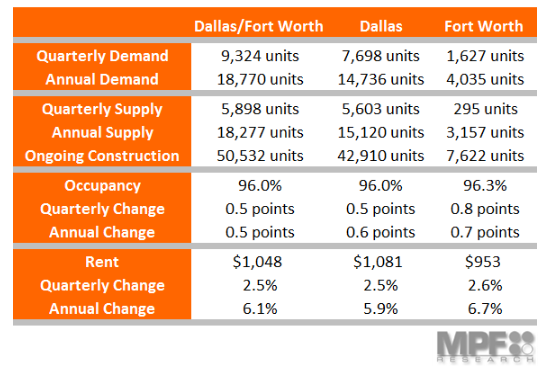 Absorption in DFW topped 9,300 units, a peak for the current cycle. The region’s demand was driven by absorption in Dallas, which reached the highest level since 2000—in Fort Worth, absorption was at a two-year high. ​Rock out to Multifamily ​data in Dallas-Fort Worth Market Research​!